LIL JON IS COMING TO PANAMA CITY BEACH AND WILL BE PERFORMING LIVE AT HAMMERHEAD FREDS. TICKETS: ONLINE TICKETS ARE $29.99 AND WILL BE $40 AT THE DOOR. The Panamaniac VIP Club Card gives you access to the biggest concerts, clubs and events and saves you big money in the process. Buy the 2019 PANAMANIC CARD and get FREE CLUB ACCESS, FREE DRINKS, FREE EXCLUSIVE EVENTS as well as other GREAT DISCOUNTS ON FOOD & ATTRACTIONS. BUY THE CARD NOW! You must be 18 years old to purchase the Panamaniac VIP Card. The Beach Bash Music Fest is the biggest daytime party in the USA. Rated as the biggest party by “Rolling Stone Magazine” this music fest party has everything a Spring Breaker could ask for with national performers, 6 hours of Music and fun!. 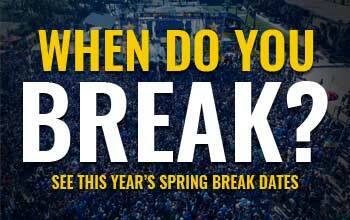 Don’t miss this huge Spring Break party! NOTE: PANAMANIAC 2019 VIP CARD HOLDERS RECEIVE FREE ACCESS TO THE BEACH BASH MUSIC FEST EVENT EACH Tuesday! NEED A HOTEL? Click here now. Wanna get WET & WILD and party in the largest foam pit in the USA? Be a part of the action this Spring Break at Hammerhead Fred’s! Every Thursday 5000 square feet of thick wet foam spills onto thousands of students from across the country in what has become the biggest foam party in the USA! Buy your tickets now as this party will be sold out! The most thrilling Spring Break party you will EVER experience. The Spring Break Glow Paint Party at Hammerhead Fred’s is a must do Spring Break event. Top electronic DJ’s from around the world, gallons of neon paint, beautiful people, awesome special effects and 5000 of your closest friends make this one of the most memorable Spring Break parties yet! This party happens every Friday in March and April in Panama City Beach Florida. Reserve your discount tickets early as this party SELLS OUT EVERY TIME!